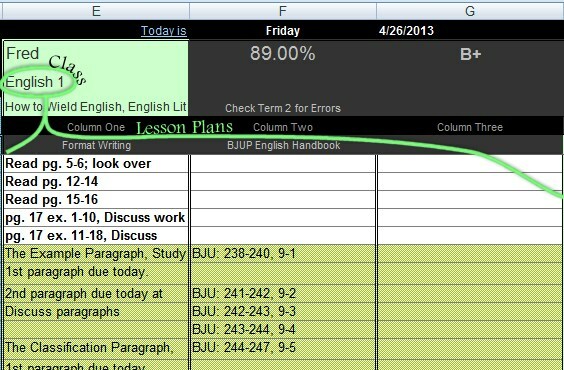 Type or paste lesson plans, into the lesson plan columns in the S-Sheets. The difficulty of this step lies in not understanding how lesson plans are handled by the lesson planners. So before entering lesson plans, please acquaint yourself with the lesson planners by downloading a V Planner that contains sample data. Those may be downloaded from the V Planner download page. Once you understand how the lesson plans are picked up by the planners, then go ahead and enter your lesson plans. As mentioned at the top, lesson plans may be pasted into the s-sheet. Please read Copy Paste under XLS-Tips before you start. To see an example of a text file with lesson plans that I created for the V Planner, go to http://donnayoung.org/art/aop-art-unit-7-comics.htm and scroll down the page, almost to the bottom to “For V Planner” and look for the text file under that. Please notice that there is one lesson plan per line. The lesson plans do not contain line breaks <– this is very important. As you might have noticed, each S-Sheet is for a certain subject (as set up at the Data# worksheets) and I know this is obvious, but please place lesson plans for each subject on each subject’s designated s-sheet. In the case of split s-sheets, place the 1st semester class in the upper part of the s-sheet and place the 2nd semester class in the lower part of the s-sheet. If you downloaded a V Planner with sample data, fiddled with it, and watched the lesson plan related videos, then perhaps the 3 columns will not intimidate you. If you are still unsure about how you want to use the 3 columns, then return the the V Planner with sample data and fiddle with it some more until you see the advantages and disadvantages of using more than one column. If you have not seen it yet, see also V Planner V3, Lesson Plan Columns to Planners. It is for V3, but it still applies. If you need a teacher’s planner and then visit the AUC3 planner. AUC3 is a block planner that set up to display the data from column 3. This is ideal if your teacher’s notes are in column 3. If you do not like how AUC3 is laid out, then use any of the other lesson planners (that are not AU). When using column 3 for the teacher’s notes and if you do not want these notes on the student’s lesson planner, be sure to hide column 3 on the student’s lesson planner. Use the S/H controls. The black and dark gray cells in rows 7 and 8 directly above the lesson plan columns may be typed in. You can place a title there if you wish. The cells in the lesson plan columns change appearance based on what is in the NS Column. This effect is for your reference only. The lesson plan fetching systems, either one of them, will fetch all plans from all three columns in the row. Lesson plans that are in the same row will show up on lesson planners on the same day. So- when using the 2nd or 3rd column, place lesson plans that will need to be followed on the same day as the plans in column 1. Likewise, grades in the same row will stay “stuck” to the lesson plans in the row and this is good. This means that grades and lesson plans will stay together unless you move lesson plans elsewhere after placing grades. There is not much else to be said about the lesson plans. If you are new to making lesson plans and want to see how I did it, please visit the pages starting at: How to Plan Homeschool.